This was as it turned out a fairly easy project. I have a fair collection of different decal’s, you never know when one could come in handy, and so whenever I’m at a toy fair I’ll always look out for ones that I haven’t already got to add to the collection. 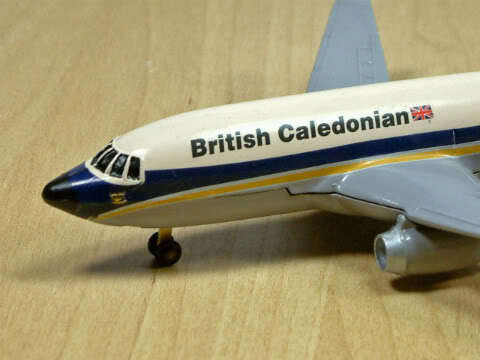 Therefore when this very playworn Dinky Lufthansa Boeing 737 came to me as part of a job lot of old toys, I already had it’s new colour scheme pretty much to hand. 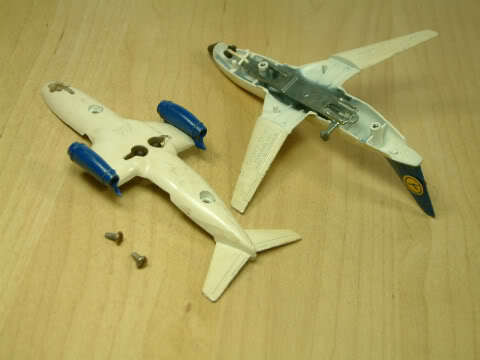 This is a later era Dinky Toy, so no awkward rivets to file or drill out, just two small screws and it all comes apart. The small lever behind the wings operates the landing gear, on a metal bracket and some hair springs. If you are restoring one of these it is worth taking a few pictures at this disassembly stage, saves a lot of head scratching later on. I’ve jumped forward a bit here in the work. 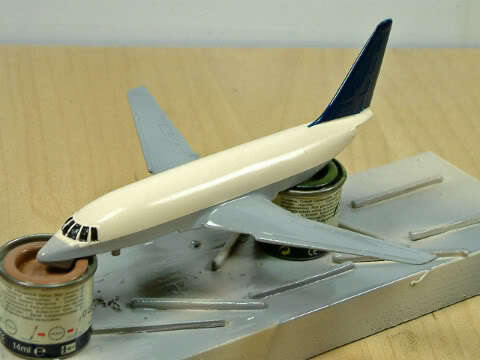 The plane has been stripped of it’s old paint, primered, and a first coat of Ivory paint added. You see it here having been masked up, and a second colour of Polar Grey added. The two tins of Humbrol enamel paint it is resting on give a good idea of scale, this is not a big model. Once the first two paints were dry, yet more masking and the tail is given a coat of dark Royal Blue. 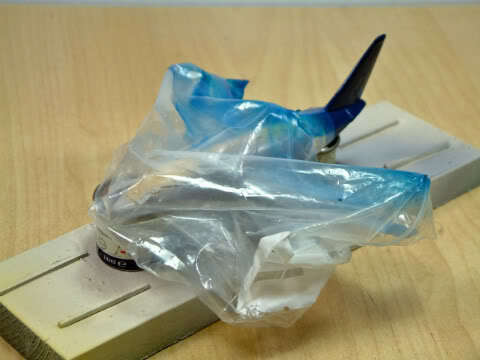 Finally the masking tape can be removed, and once again it starts to look like an aeroplane. Not much detailing work needed to be done on this model, just the cockpit windows filled in with Satin Black. 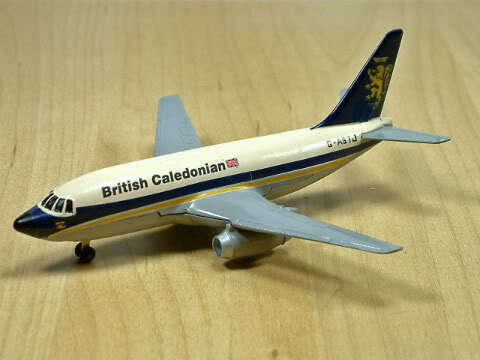 The finished aircraft, looking resplendent and rather apt in the colours of British Caledonian. 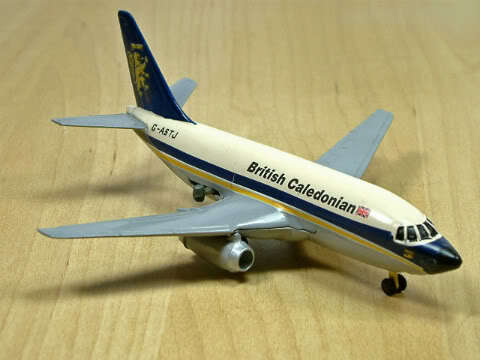 An airline livery no longer around, on a model from a company also no longer around. The decal set was not made for this model and so had to be altered slightly. Still, I think they go together well. 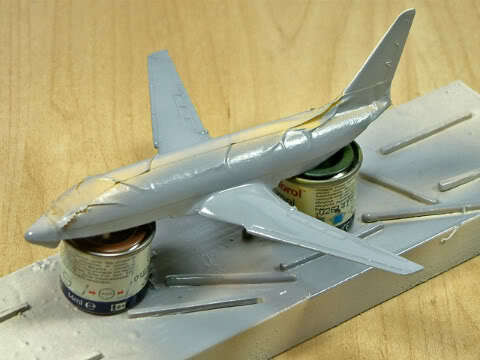 This entry was posted in From the workshop (Code 3) and tagged 737, BCAL, Boeing, British Caledonian, code 3, Dinky, Lufthansa. Bookmark the permalink.